Some news from Twitter this week could leave you with the impression that spam is becoming a dinosaur of the Web. As of February, slightly less than 1 percent of posts on the micro-blogging site were unwanted spam, according to a blog written by Twitter's chief scientist, Abdur Chowdhury. Not too long ago, spam was more rampant on the site, according to an info-graphic published by Twitter. 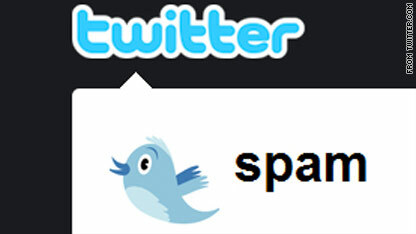 In August of 2009, for example, nearly 11 percent of all Twitter posts were spam. So, maybe this means we're getting past the era of computer-generated messages and malicious and trickster ads? A look at the broader picture reveals we're not even close. A whopping 9 out of 10 e-mail messages are still unsolicited, according to this helpful chart (.pdf) published by New Scientist. The chart shows a number of fluctuations over the years, but an overall increase in spam since late 2006, when hackers started developing "botnets" of "zombie computers" that can send spam and malicious software out for them. In June 2009, the average e-mail account received more than 100 spam messages per day, according to the chart. A recent 3,000-person e-mail survey found nearly half of people continue to click on these messages, even if they know spam is a problem, The Toronto Sun reports. The U.S. Department of Homeland Security has a Web page with tips for how people can reduce and avoid spam, but the agency acknowledges that "you will probably not be able to eliminate it." Among its more-helpful tips: Create an extra e-mail account that you use to sign up for mailing lists and register for Web sites; and don't let your e-mail account automatically download image attachments for you, since those can identify your account to spammers. Security experts also recommend people create new passwords for all of the Web sites they register with. Twitter has posted a number of tips for reducing spam on its site, too. Among them: Report spam messages by sending a note to the Twitter's @spam account; or select the "report for spam" option from a drop-down menu on a problematic Twitter account's page (the menu is hidden behind an icon that looks like a gear wheel). Do you get more spam than you used to? What's the funniest spam message you've ever gotten?